So season thirteen concluded with a bang and a joke. This story was too scary for our son to ever want to see again – that’s this season in a nutshell – but he enjoyed the explosions and the Doctor and Sarah sharing a smile at the coda. I actually gave him a heads-up that the composting machine that frightened him, and absolutely everybody else who watched this, in episode four would be back to menace Sarah tonight, but that she’d be fine. The scene really is an amazingly tense one, with Tony Beckley’s character doomed, but he and Tom Baker fighting with amazing desperation. The entire production is just terrific. I really enjoy the visuals and the music, and how the actors are playing this situation entirely believably. They’re trapped and terrified and I think this really rubbed off on our son. This and “Pyramids of Mars” are just wall-to-wall shocks. What a great, great season. Except for the last half of “The Android Invasion,” but 24 out of 26 episodes is an excellent run. Speaking of “The Android Invasion,” I was saying how we wuz robbed of a farewell scene where the Doctor tells his friends that he’s moving on. Isn’t it strange that when the Doctor escapes from Harrison Chase’s estate, it’s to contact Sir Colin of the World Ecology Bureau? You and I know the production reason is “Because they’re paying that actor already and built the set for his office,” but he doesn’t make a beeline for a phone to call Harry, Benton, or Colonel Faraday. We hear that the Brigadier is in Geneva (still, or again, I wonder) and a Major Beresford is in charge, but why doesn’t the Doctor phone his other friends? The story opens with the Doctor already in the UK and visiting the World Ecology Bureau on somebody’s recommendation. Have he and Sarah been in England for some time, and he’d already told his friends goodbye and turned in the keys to his old lab? Is that why he wants to rush to Sir Colin, because he didn’t want to phone Harry a couple of days after figuring he was gone for good? Anyway, a couple of goodbyes to note this time. This is the final Doctor Who story to be directed by the great Douglas Camfield, and the last of two to be written by Robert Banks Stewart. He’d go on to create two extremely popular crime dramas for the BBC, Shoestring and Bergerac. Camfield directed three episodes of Shoestring along with several other notable shows over the next eight years, including an eight-hour adaptation of Beau Geste, episodes of The Sweeney, The Professionals, and Danger UXB, and the acclaimed miniseries The Nightmare Man. Readers may recall that Camfield had a heart condition that waylaid him during production of the Who serial “Inferno” in 1970. He died of a heart attack in 1984, aged 52. When I was younger, I didn’t quite understand the fuss about Camfield. When I later felt the energy and the tension that crackles through his stories, I got it. He brought out some of the very best performances from all of the actors and really made these last two serials in particular something very special. Doctor Who often rises above the quality of its production, but it would be many years before the show would have a director who could kick things up quite as high as Douglas Camfield could do it. We’ll take a short break from Doctor Who for all those in the audience with a nervous disposition, but stay tuned! We’re planning to start season fourteen in just a couple of weeks! 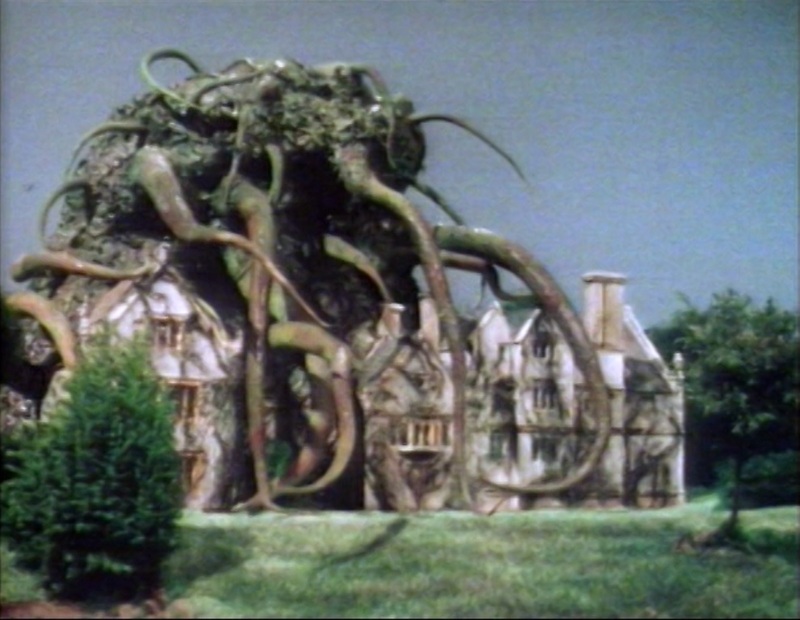 The story moves back to England for its middle parts, making this kind of unique in the seventies Earth stories in that it’s an actual globetrotter. Most alien invasions of the planet head straight for the UK. This one came to Antarctica tens of thousands of years ago. And once the show comes back to familiar ground, the horror quotient just skyrockets. Our son absolutely hated the cliffhanger to part three, when it looks like the Krynoid pod is going to infect Sarah, and part four is just wall-to-wall terror. The big composting machine had him running upstairs to his own room. He came back down just in time to see the infected man, Keeler, lose every trace of his humanity. It’s a terrific shock moment, with the butler dropping his tray at the sight of a huge, angry, green monster in the room. He bolted upstairs again. “Yeah, I’m not surprised. That really was a scary scene,” his mother said. Conventional wisdom has it that the larger size Krynoid, which is a throbbing green mass about twelve feet high, isn’t the most convincing monster, but our son swears that’s the scariest moment yet. This is a great story, even if our son’s fear factor meant that we were a little bit distracted. In lighter news, Sylvia Coleridge joins the cast as a daffy old lady, because that’s what she specialized in playing. There’s a repeat of the “And the music’s terrible” gag that was used in the previous story. Then, the Doctor was sick of the Sisterhood singing their hit “Sacred Fire, Sacred Flame.” This time, Tony Beckley’s character is playing Chick Corea’s keyboard parts from Miles Davis’s 1970 Fillmore West show because he thinks it will help his plants grow. Don’t believe me? Compare Beckley’s noise in that scene to “Masqualero” on Black Beauty. He’s lucky his plants don’t strangle him to death. Lots of little things help us suspend disbelief in television, and one of them is that the protagonist and his antagonists need to be participating in the same balancing act. Here’s an illustration: there have been all sorts of westerns at all levels of melodrama. Marshal Dillon from Gunsmoke needs a certain type of villain who plays by the rules of his world’s narrative, and Bret Maverick needs a different type of villain for his, and the Man With No Name needs another one for his. If you break those rules and give one of those heroes a villain who plays the game a different way, the narrative will jar. It’s not only the mix in appropriate acting styles for the production, the whole world will seem off. That’s what happens when the Doctor meets Scorby, a henchman played by John Challis. You’ll occasionally find critiques of “The Seeds of Doom” that say it feels wrong. That’s because Scorby has wandered in from an entirely different program. The Doctor has met “ruthless” characters before, but they’re Doctor Who ruthless. The Doctor disarms them with witty banter and makes them respond with television tough-guy language like “Have a care, Doctor!” Even while that ruthless henchman is pointing a gun at him, the Doctor is the hero who’s still in charge waiting for the last minute rescue. (Think Mailer back in “The Mind of Evil” for a good example.) This is the Doctor’s show, and these are the rules of this world. But Scorby doesn’t play by those rules. The Doctor quips and jokes in the face of death and it doesn’t work. 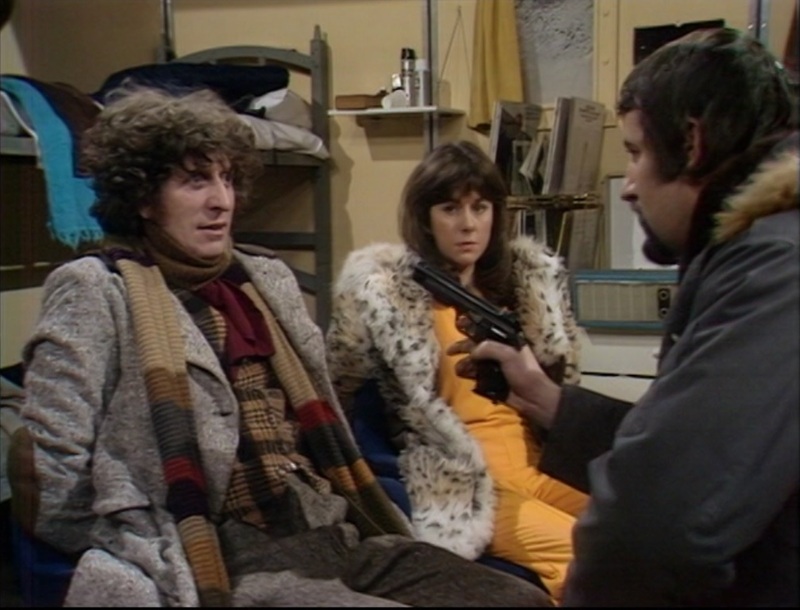 Scorby might have come from The Sweeney, where a hero figure like the Doctor wouldn’t be any more successful than DI Regan would have been at foiling any phase of the Kraals’ invasion. And since Scorby has the upper hand, he ignores all the Doctor’s tricks and leaves with Sarah – not as a hostage, just to kill her after she leads him to another point in the plot – and the Doctor, helpless and desperate, is reduced to screaming after him. It’s an amazing moment, but anybody who says the show feels “wrong” is quite correct. I think this is the reason why. Anyway, our son remembered that an earlier story was called “The Seeds of Death,” and he decided, in his inimical fashion, that the two stories would be very similar, except the first one would have more death and less doom, and this one would have more doom and less death. He’s actually right, because the tone of the two productions couldn’t be more different. Tom Baker is playing the Doctor as genuinely scared for the first time, and the whole thing, even with the horrible plant-man stomping around an Antarctic research base, feels doom-laden, but it won’t have quite the body count of the Patrick Troughton story. “The Seeds of Doom,” written by Robert Banks Stewart, is another one with a great reputation for scaring younger viewers, but fortunately ours is actually young enough to not really be bothered by the body horror aspect of it. Nor was he concerned by the exceptionally grisly suggestion in part one that a character’s arm might have to be amputated. Actually, the really grisly aspect was convincing a character that he has no choice but to perform that surgery, but that’s more frightening to adults! Both cliffhangers had him hiding, but these are more traditional monster scares. Once again, and sadly for the final time, the direction and the music are from the dream team of Douglas Camfield and Geoffrey Burgon. In the role of master villain Harrison Chase, whom the Doctor has yet to meet, it’s the great Tony Beckley, who had played Camp Freddie in The Italian Job, which is probably another reason why I should show that fun film to our son when he’s a little older! It’s funny how my son and I look at Doctor Who from totally different perspectives. For me, the show almost always starts strong and peters out as it goes, the initial mystery and atmosphere giving way to basic plotting and the world being doomed by this month’s threat. Fortunately, Who has enough charm, wit, and fun that it often doesn’t matter all that much. But our kid keeps looking at it this way: Doctor Who is a scary, scary program where scary things keep happening and the bad guys have control of the situation for a very long time, and it scares the bejesus out of you, until finally the Doctor wraps things up and there’s usually a big explosion or two, at which point it becomes one of television’s great pleasures. Once again, he grimaced and hid through three episodes, only to rise cheering when the Zygon spaceship blows up, and when the Loch Ness Monster arrives in London for a few seconds before going home. It’s one of the all-time awful special effects. Kitten Kong was more convincing. Ah, well. It looked and sounded terrific up to then. We’ll allow director Douglas Camfield a few seconds of fumble in an otherwise glittering career. Harry decides to stay on Earth after this adventure. We’ll see him again in a few weeks, along with John Levene’s long-serving character Benton, who had been promoted to warrant officer during the events of “Planet of the Spiders” and “Robot,” and promoted again to regimental sergeant major prior to this story. Even though the character is last seen in the series as RSM Benton, everybody always calls him Sergeant Benton. Surprisingly, when they come back, it will be without the Brigadier. 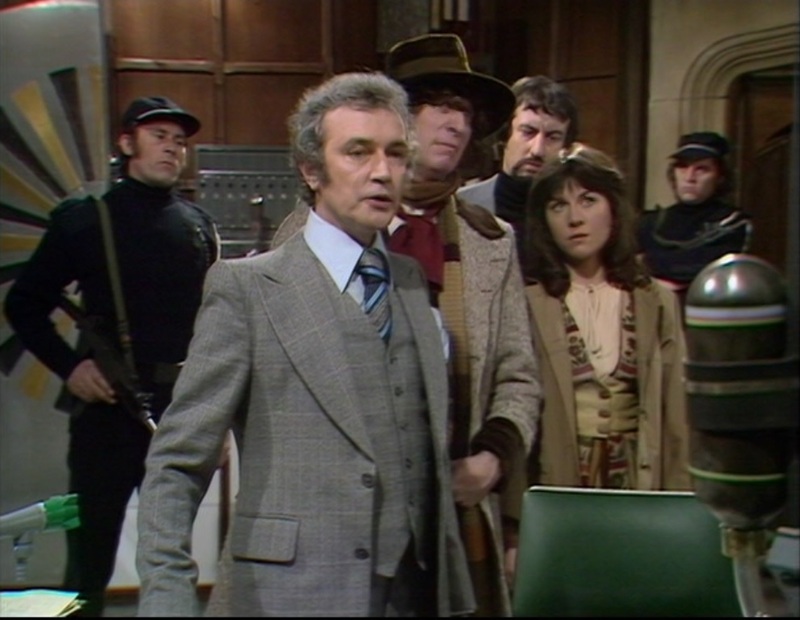 Nicholas Courtney would have another acting commitment when the next, and final UNIT story of the seventies was made, and so this story becomes his swan song as a semi-regular. None of these three characters get a proper goodbye. Courtney would turn up again in three Who stories in the 1980s, and one installment of The Sarah Jane Adventures in 2008. Between “Zygons” and Courtney’s next appearance in Who in 1983, Courtney mainly worked in the theater. He made occasional small guest star parts on TV, but bizarrely, a starring role in a sitcom was completely shelved for eleven years. In 1982, he starred opposite Frankie Howerd in a six-part series called Then Churchill Said to Me, with wacky hijinks set in that top secret wartime command bunker that Matt Smith’s Doctor once visited. The BBC, being as overcautious and oversensitive as ever, decided that they shouldn’t broadcast a comedy making fun of the military in the middle of the Falklands Islands crisis, but once it concluded, they just left it in the cupboard. It finally aired on a cable channel in 1993, and, if you’re a fan of Howerd’s humor like I am, it’s really an amusing show. I just think it stinks that Courtney was denied a starring part at a time in his career when he really could have used one. And now back to September 1975 and season thirteen of Doctor Who. The season started with a very popular and well-remembered serial written by Robert Banks Stewart, directed by Douglas Camfield, and featuring my absolute favorite incidental music in all of Who, by Geoffrey Burgon. These three would also be responsible for making the season finale look and sound so good. Camfield and Burgon’s work here is so atmospheric and so wonderful that anybody with a heart and soul would be happy to overlook the story, which is a by-the-numbers tale of alien monsters who speak in Alien Monsterese, with phrases like “centuries by your timescale” and “one Earth mile.” The Zygons are shapeshifters without a home planet, and they only appeared this one time in the original run of the show, but they’re so well remembered, in part because, well, never mind their dialogue, just look at that wonderfully gross design and the terrific costume! 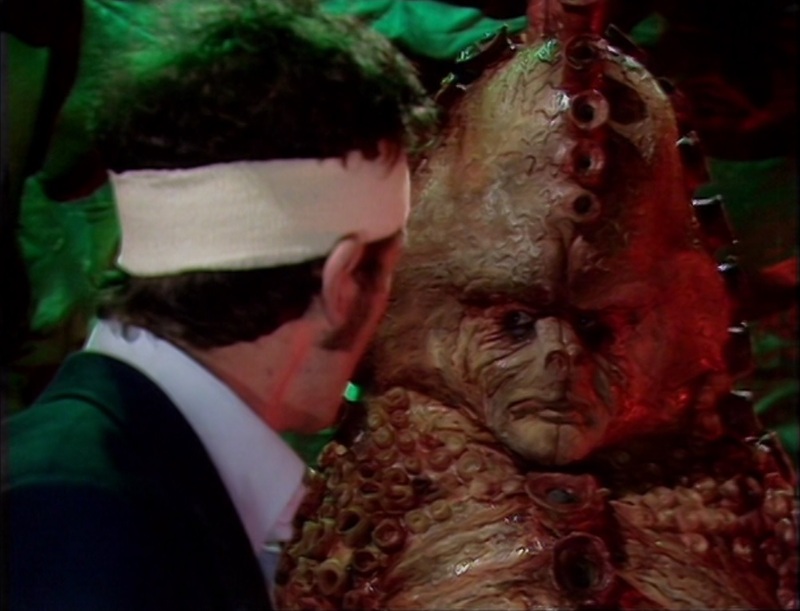 Anyway, everybody remembered the Zygons and their pet Loch Ness Monster from their childhoods, so they’ve come back in a couple of stories under Steven Moffat’s time as producer and have been referenced a couple of times more. Our son was petrified by these episodes. He was so scared! He tells us that the most frightening scene was when the Doctor extracted the cast of the monster’s gigantic tooth. He also didn’t like Harry getting shot, the Zygon grabbing Sarah from behind in the corridor, and the Zygon trapping the Doctor and Sarah in the decompression room. He especially didn’t like the Zygon that was impersonating Harry hiding in the barn and getting ready to attack Sarah. Part two ends with the giant monster chasing the Doctor across the moor, and he didn’t like that either. His latest way to fend off scary beasts is to wrap his security blanket, “Bict,” around his head, instead of wadding it up in front of his face. He’s going to be doing that a lot this season! Oddly, though, the revelation during the cliffhanger climax that the dinosaur-creature is the Loch Ness Monster rebounded without impact. Bizarrely, he did not know what the Loch Ness Monster was. If you were six years old in 1975, you knew about Nessie. If he ever has heard a reference to it, he’s forgotten. True, this kid doesn’t have a very good memory, but clearly this monster needs a new PR firm. One note from my own youth, and seeing the TV movie of this story in February 1984: I absolutely loved it, of course, although I was still unclear how the heroes travel around. The story opens with the Doctor, Harry, and Sarah already in Scotland. I remember having a very hard time putting all this together. This was my third story. 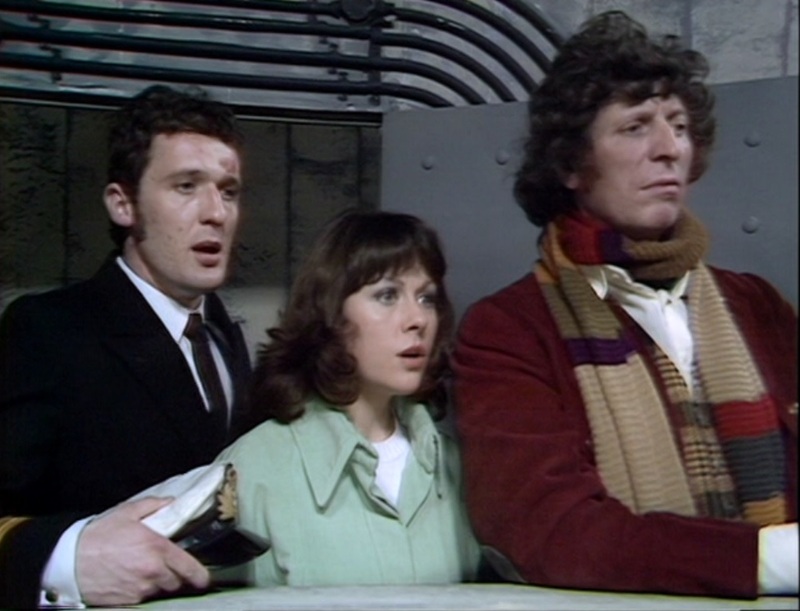 In “Genesis of the Daleks,” their transmat travel is intercepted by the Time Lords, and at the end, they use a Time Ring to go back to Nerva Beacon. They get inside a blue box at the end of “Revenge” – the same blue box that’s in the opening credits – and it vanishes. Is it a magic cabinet, or does the transmat beam send them in that protective “capsule” to their next destination? I guess when a show’s been on television for twelve years, there’s an assumption that some grownup in the audience can explain all this stuff to new viewers! Us poor kids watching the compilation movies late Saturday nights on PBS without any reference needed some help. And help was indeed on the way, as I’ll relate in a week or so.